State insurance exchanges are going up this fall under the Patient Protection and Affordable Care Act, also known as Obamacare. Unfortunately, scammers are seizing the opportunity to try to get consumers to provide them with personal information such as Social Security numbers and checking account identification. Someone offers to help you find the best deal on the new insurance exchanges – for a fee. In order to pay the fee, you usually have to provide a credit card number. There are official people who will help you navigate the exchange marketplace, but they are not allowed to charge you for the service. Scammers call and tell you that Obamacare requires you to get a new Medicare card or a new insurance card. However, before they can send you the new card, they need your Social Security number and other personal information. But, the FTC notes, Obamacare does not require you to get new Medicare or insurance cards. Anyone without health insurance can be subject to a penalty under the law. Some scammers say they can get you a discount plan that meets the requirements of the law. Again, you probably will be asked to provide personal information, including credit card numbers. But these “discount plans” do not actually provide insurance. They just allow you into a kind of club that claims to have negotiated discounts from specific providers – which is what most insurance already does. Some of these offers end up with you paying a fee for something you don’t need, and some end up with you being the victim of identity theft or worse. Some scammers pretend to be from the federal government, calling to verify some information such as your bank account or Social Security numbers. They might even have a phone number that looks official when it shows up on your caller ID. But they are just trying to get access to your personal information. There probably will be even more scams regarding Obamacare before the law is fully implemented. Dishonest people like to take advantage of change and confusion such as that surrounding the law. In a similar way, scammers come out in force when there is a disaster of some sort, pretending to be collecting money to aid the victims. And of course, there are always people trying to find out information such as your bank or credit card numbers. The FTC suggests that you never give out personal information over the phone or via email, or to someone you don’t know. If someone calls asking you for money or information, ask for a phone number where you can call them back. You also can ask for an address and, if the caller is local, you can drive past and check it out. Before you give money to an organization, do a little research. Make sure the group is legitimate and that most of the money it collects actually goes to help the cause it supports. You also can check online to see if the organization has had a lot of consumer complaints. Check your credit card and bank statements at least monthly, and investigate any charges you don’t recognize, no matter how small. 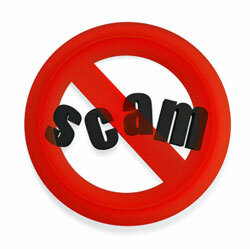 If you feel you have been contacted by a scammer, file a complaint with the FTC.